The Hokkaido Canada Society was established to deepen understanding and further promote exchanges between Hokkaido and Canada. Hokkaido, which is blessed with its spaciousness, natural scenic beauty, and plentiful natural resources, is viewed within Japan as a region with great potential. Hokkaido’s cold and snowy climate, however, make it necessary to strive to create a comfortable winter lifestyle. Thus it is important to collaborate with other northern region countries like Canada, to promote exchanges in many different fields such as culture, education, sports, and economic activities. It is hoped that the Hokkaido Canada Society continues to play an active role in the development of relations between Hokkaido and Canada. The Hokkaido Canada Society is always happy to welcome new members. We would therefore like to extend an invitation to become a society members to: Canadians living in Sapporo, to people with an interest in Canada, and also to those with interest in international exchange. 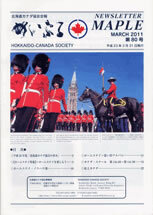 Please contact the Hokkaido Canada Society for further information. The Hokkaido Canada Society promotes the following activities to provide deeper understanding of Canada for its members, who have either visited Canada or are interested in the country and its people. The Hokkaido Canada Society invites lecturers knowledgeable about Canada to give speeches relating to various aspects of Canada. Events will be organized to provide information concerning educational institutions in Canada in cooperation with the Canadian Embassy and the Canadian Education Agency. 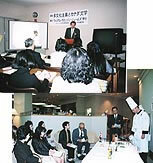 Various information is provided on activities sponsored by the Hokkaido Canada Society, as well as current information about Canadian society, politics and economy. This Conference is held to exchange information between municipalities of Hokkaido twinned with Canadian municipalities. The venue,schedule and conference themes are decided with the consent of each municipality. 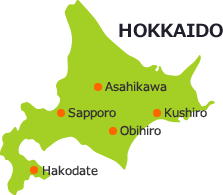 The Hokkaido Canada Society works with other associations and organizations in providing information and support to their exchange activities related to Canada. Copyright© Hokkaido Canada Society All Rights Reserved.